Enable the masonry option to show your columns in style while making the most of unused space. Choose to make your latest post featured, making it larger than other posts and giving you a magazine-like layout. Numbered pagination is built into the free version, but AJAX pagination loads new posts without reloading the page. Share your posts with Twitter, Facebook, Google+ and Pinterest. There’s also an awesome “Love it” button for your readers. Read more button colors, borders and padding – style your posts to match your theme easily with these awesome options. Open your post images in a lightbox and even turn them into a lightbox gallery. Great for highlighting your photography or products! 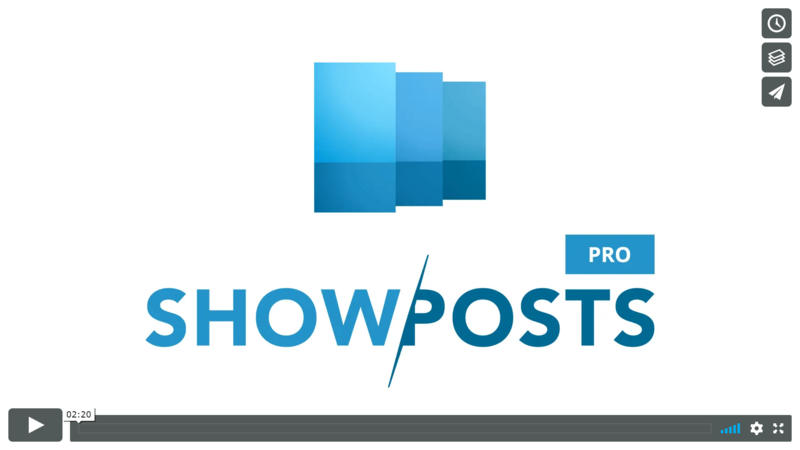 WP Show Posts is still super young – new features are being built daily and will be included in your updates. Yes, your license key is valid for one year from the purchase date. This license must be active in order to receive automatic updates or use our support forums. License keys can be renewed at a 50% discount from the purchase price. Absolutely, you’ll be able to update the plugin inside your Dashboard just like all of your other plugins once your license key has been activated. Yes, we stand behind our products 100%. If you’re unhappy with your purchase within 30 days of ordering, we’ll be happy to provide a 100% refund, no questions asked! I need help, where can I find support? We’re happy to help, free users can use the WordPress.org forums to ask for help, while users with a valid license key can access our support forums right here.